Ordering the food mix hedgehogs thrive on here is easy. Click on the button for the amount desired. Food typically ships off USPS within 48 hours. One bag of food is enough for about 6 months. 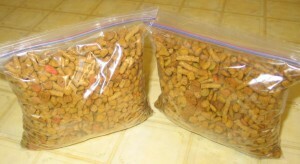 If ordering more than one bag, please keep the other in the freezer to maintain freshness. If you are wanting to make your own mix – I strongly encourage you to steer clear of commercial hedgehog foods, and cat foods with complex proteins, and the newer ones with no grains.